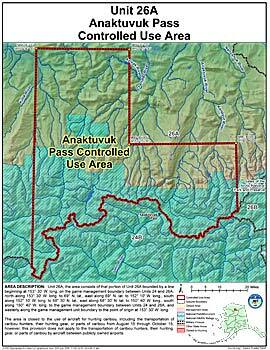 Area Description: Anaktuvuk Pass Controlled Use Area: the area consists of that portion of Unit 26(A) bounded by a line beginning at 153° 30' W. long. on the game management boundary between Units 24 and 26(A), north along 153° 30' W. long. to 69° N. lat., east along 69° N. lat. to 152° 10' W. long., south along 152° 10' W. long. to 68° 30' N. lat., east along 68° 30' N. lat. to 150° 40' W. long., south along 150° 40' W. long. to the game management boundary between Units 24 and 26(A), and westerly along the game management unit boundary to the point of origin at 153° 30' W. long. Restrictions: The area is closed to the use of aircraft for hunting caribou, including the transportation of caribou hunters, their hunting gear, or parts of caribou from August 15 through October 15; however, this provision does not apply to the transportation of caribou hunters, their hunting gear, or parts of caribou by aircraft between publicly owned airports.